- How many times was my QR Code scanned/used? - How can I easily track my QR Code(s)? Get a free Google short URL with statistics (URL tracking). Then use the Google short URL to create your QRickit QR Code at http://qrickit.com/ or using the QRickit Widget here. Google gives you a link to a page where you can view basic stats for the short URL (a "click" means someone scanned your QR Code and went to the short URL). If you wish to track the same QR Code displayed in several places, you can get multiple Google short URL's that point to the same long URL (i.e. get one Google short URL for the QR Code on your flyer, another one for your magazine ad, another one for your business card, and so on). Tip: If you are only allowed to make 1 short URL per long URL, you can append something to the end of the long URL which makes the long URL unique but does not affect it. For example: qrickit.com/index.html?id=1, qrickit.com/index.html?id=2, etc. By appending ?id=# it makes the long URL unique but it will always leads to qrickit.com/index.html. Tracking a QR Code means we are tracking the URL associated with the QR Code. So tracking only works with QR Codes embedded with URL data. For users who need a more advanced solution and analytics, please see my earlier post about using multiple QR Codes, Google URL Builder and Google Analytics. "There is no real way to track how many people scan a QR Code embedded with contact info. But since it is possible to track URL's, one possible solution is to use a QR Code embedded with a URL. For example, when people scan your QR Code they will get a URL which leads to an online page (this is the page you will track) that could say "click to download my vcard" or "click to add me to your address book". So just put your vcard file online (i.e. on your web server) and create a web page with a link to it. You can track this page using Google Analytics (as explained in an earlier blog). *Issue: iPhone's Safari browser (and some other phones) cannot directly download a vcard file from the web. But if emailed to the iPhone as an attachement then it can be opened and added to the address book. That means iPhone users have to provide their email address to get your vcard (which may or may not be a bad thing). You can program a form on your page that will email your vcard file to the submitted email address. The above requires some programming skills, but your local web guy/gal should be able to do it..."
*Since extended contact info in a Vcard contains a lot of data to embed in a QR Code it usually results in a QR Code image that is too dense for some mobile phones/reader to scan and process. That is another reason to use the solution above for QR Codes and contact info. 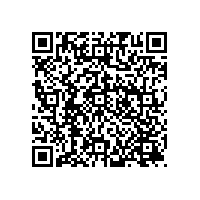 The QR Code Creator at QRickit.com allows you to make a QR Code embedded with basic contact info (MeCard and vCard).